Dating back to the 14th century in Nuremberg, Elisenlebkuchen (German Lebkuchen) have stood the test of time as one of Germany’s most popular and beloved of all Christmas treats! Having grown up in Germany it’s the Christmas season when I get the most homesick. The snowy landscapes, the decorations, the Christmas markets, and all the delicious Christmas goodies…you just can’t beat Christmas in Germany. One of Germany’s most famous Christmas treats (and one of my personal favorites), is Elisenlebkuchen. Lebkuchen go all the way back to 14th century Germany where they were created by Catholic monks. 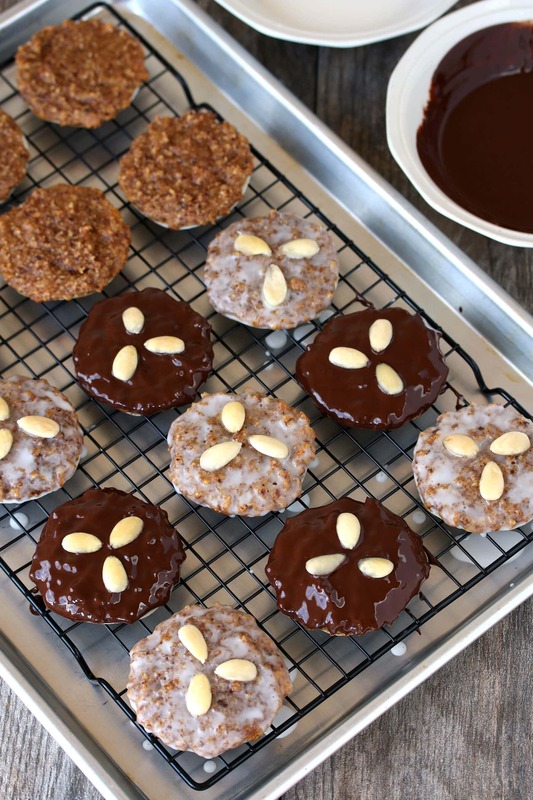 Prepared in monastery bakeries, Lebkuchen included honey, a variety of spices and nuts. These ingredients not only had symbolic religious meaning but were highly prized for their healing properties. 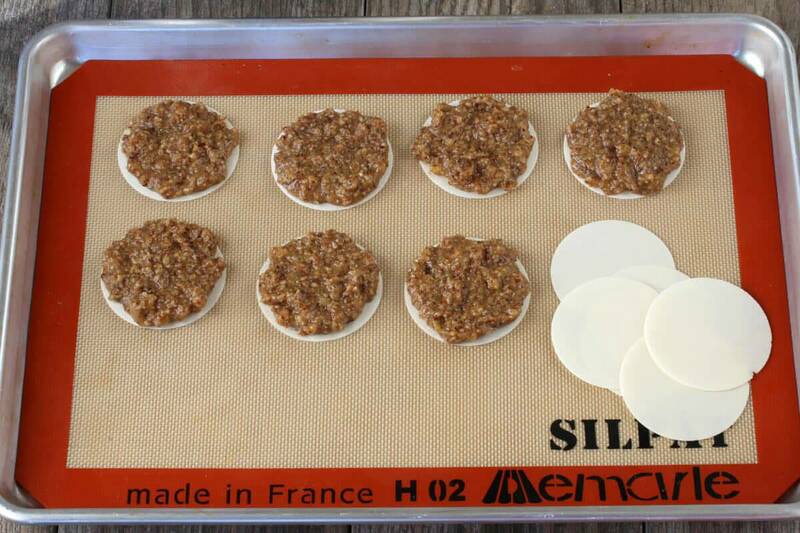 Those clever monks not only created an exceptionally delicious sweet treat, they found an additional use for their communion wafers: They increased the diameter size and used them as the base for the sticky gingerbread dough – a perfect solution. A quintessential sweet treat throughout all of Germany during the Christmas season, Lebkuchen is one of the most popular and beloved of all German holiday confections. There are a variety of Lebkuchen, each distinguished by slight alterations in ingredients and most especially the amount of nuts used. But the most highly prized of all are the Nürnberger Elisenlebkuchen. The title is a regionally protected one and only Lebkuchen produced in Nürnberg can be sold as such. The distinguishing characteristic of the Elisenlebkuchen is that they use no flour and have a very high ratio of nuts, specifically a combination of almonds and hazelnuts. An absolutely critical ingredient in these Lebkuchen is Lebkuchengewürz. You cannot make these without Lebkuchengewürz. Period. Not if you want them to taste like real Lebkuchen. And Lebkuchengewürz is virtually impossible to find here in the U.S. unless you’re lucky enough to have a well-stocked German grocery store near you. Even Amazon only has one option to choose from and it’s pricey (a week ago they still carried it but as of right now it’s no longer available – but that may change). But have no fear because I’ve got you covered! Here is my recipe for Homemade Lebkuchengewürz, an absolutely magical blend of spices. And even if you find some store-bought Lebkuchengewürz locally or online I still recommend that you make your own because it’s a hundred times better! A richer, deeper, more vibrant flavor. 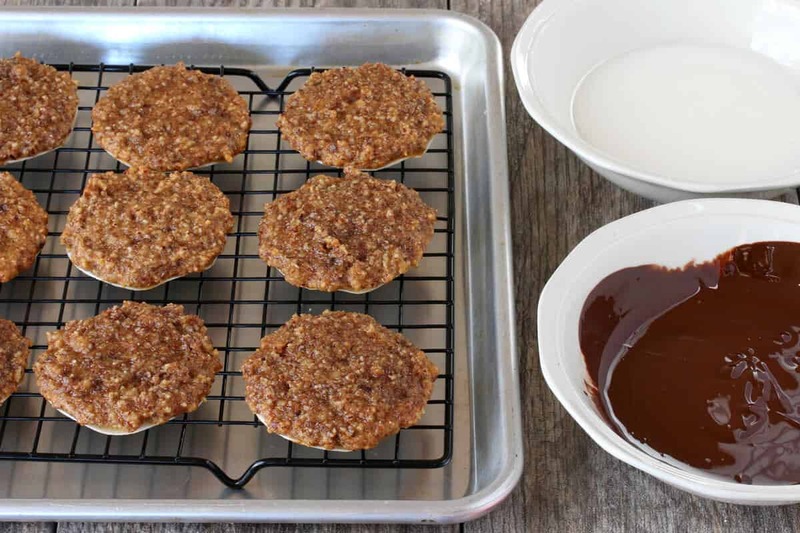 If you add this homemade Lebkuchengewürz to any authentic German recipe calling for Lebkuchengewürz you’ll close your eyes and feel like you’re back in Germany. Growing up in southern Germany I always looked forward to when the Elisenlebkuchen came available. And as good as the store-bought ones are, wait till you try homemade! The texture and flavor of these Elisenlebkuchen is sublime. They keep for a long time and their flavor only gets better the longer they sit and the flavors can ripen. For a truly unforgettable German Christmas pastry, you must give these a try! In addition to the step-by-step photos of the preparation process, I also filmed the process so you can see the entire process from start to finish via video! Sometimes it helps to have clear visual. On a side note, here’s a little trivia for you classical music lovers. I specifically chose Pachelbel’s Canon as the backing track. Can any of you guess what Pachelbel has to do with Nürnberger Elisenlebkuchen? Answer: Pachelbel was from Nürnberg. Score! Okay, check out my video on how to make Traditional German Nürnberger Elisenlebkuchen! If you watched the video you can scroll straight to the recipe. 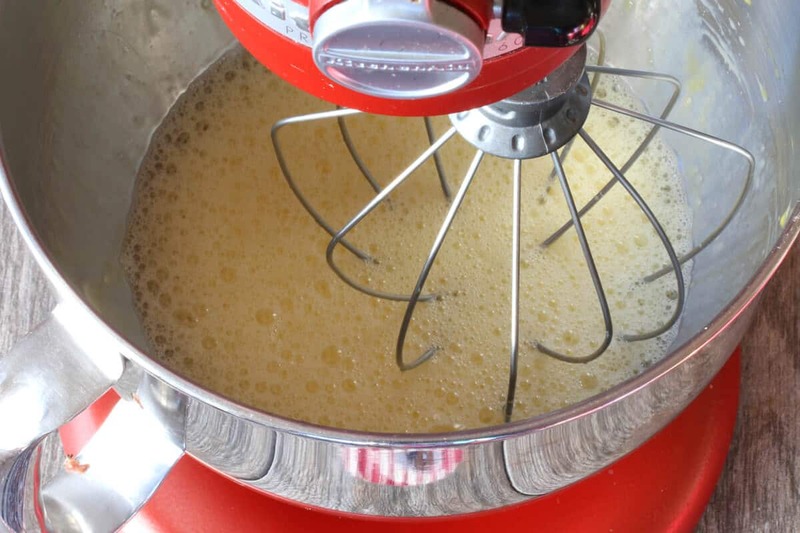 You can use a hand mixer or a stand mixer. 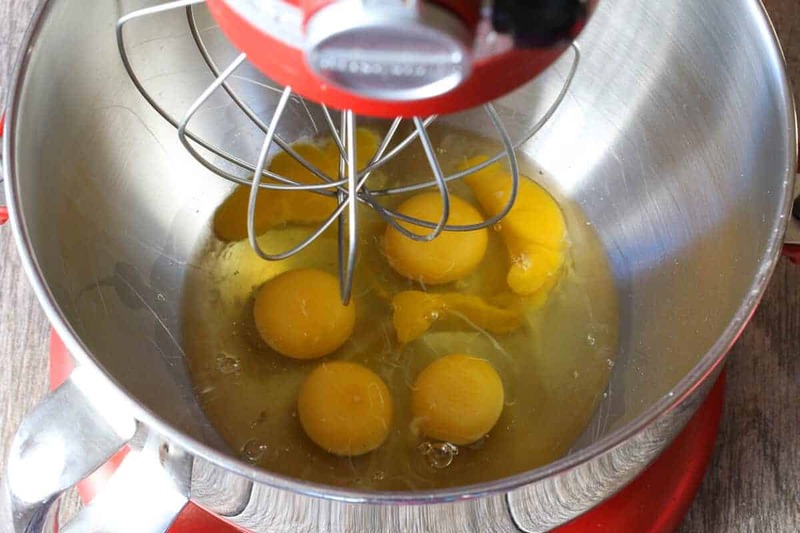 Place the eggs in a large bowl and beat the eggs until foamy. Add the brown sugar, honey and vanilla extract. Beat until combined. The candied lemon and orange peel need to be very finely minced. The best way to do that is to place them in a bowl and toss them with about 1/4 cup of all-purpose flour to prevent them from sticking together. Place it in a food processor and pulse until finely minced. 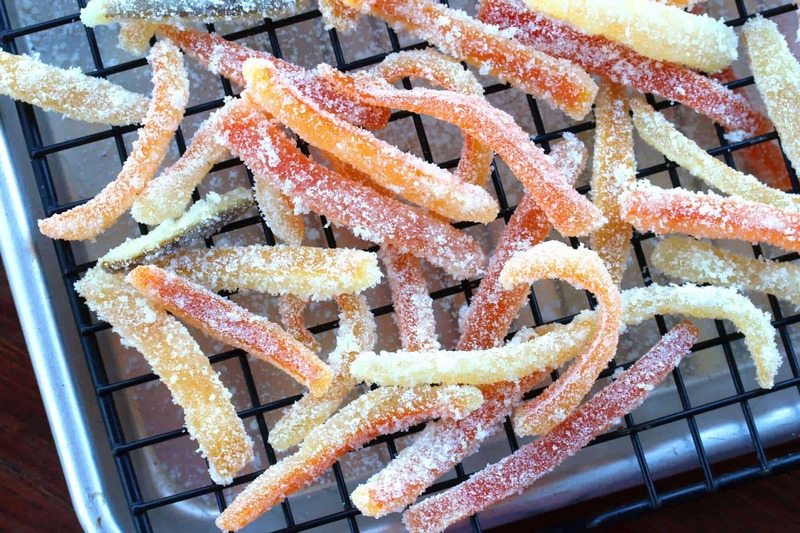 If you want truly amazing results, make your own candied citrus peel. The flavor is amazing. It’s super easy to make and once you’ve tried it you’ll never get the store-bought stuff again! Here is my recipe for homemade candied orange and lemon peel. Add the nuts, salt, baking powder, Lebkuchengewürz and candied lemon peel. 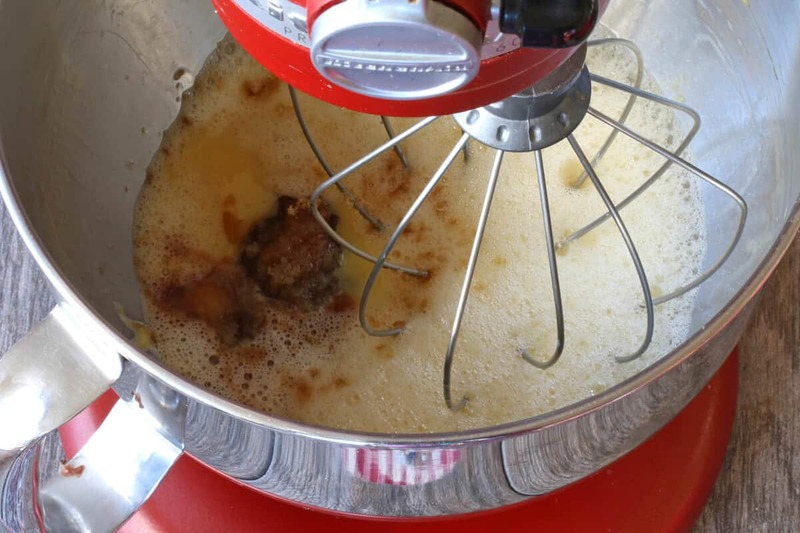 If using a stand mixer, use the paddle attachment and beat on medium for about 2 minutes until thoroughly combined. If you’re not using a stand mixer, beat vigorously with a wooden spoon until thoroughly combined. The mixture will be wet. If it’s too runny to scoop onto the oblaten add some more almond or hazelnut meal. An essential item for Elisenlebkuchen are Backoblaten. 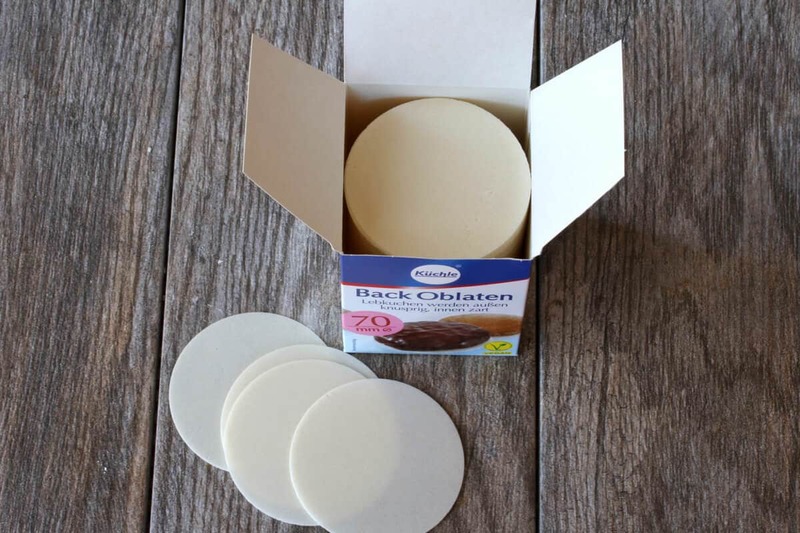 You can get Backoblaten in three sizes: 90mm, 70mm and 50mm. 50mm is mostly used for smaller items like cookies. You can use either 90mm or 70mm for the Lebkuchen depending on how large you want them. Amazon currently has the 70mm oblaten available. Scoop some of the mixture onto the Backoblaten, smoothing the top and leaving just a tiny bit of an edge around the rim. Place them on a lined cookies sheet. In an oven preheated to 300 degrees F, bake the Lebkuchen on the middle rack for 25-28 minutes. Remove and let cool completely. Once the Lebkuchen have cooled, make the glaze. 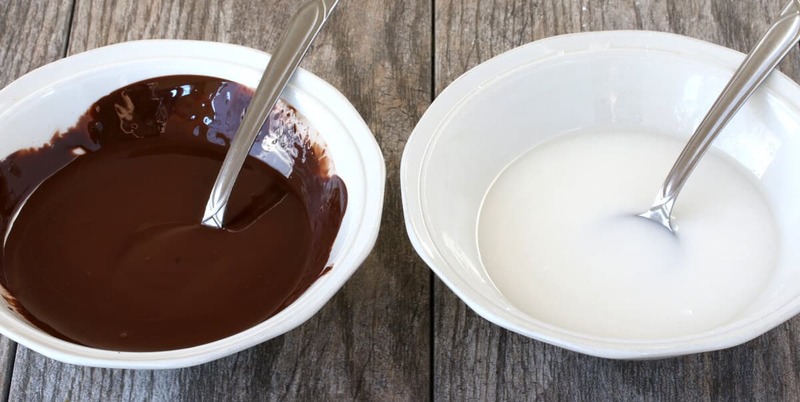 For the chocolate glaze, add the chocolate and oil (I use and love coconut oil for this) and a small bowl and microwave, stirring occasionally, until melted. You’ll want to use it immediately as it will start to firm. If it does firm up simply reheat it for a few seconds in the microwave. 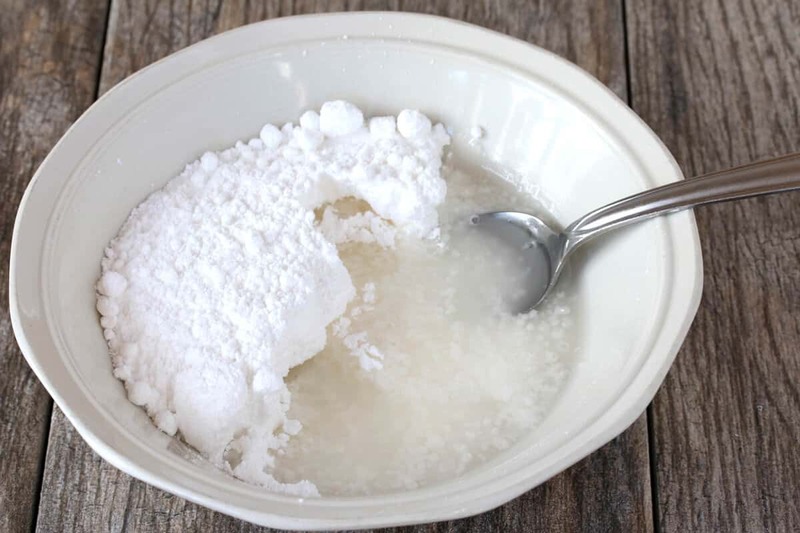 For the sugar glaze, in a small bowl combine the powdered sugar and water and stir until smooth. Traditionally Lebkuchen are made with these two glazes and some are kept natural (no glaze). Do whatever you prefer. Chocolate-dipped Lebkuchen have always been my favorite. Position a wire rack over a cookie sheet to catch the drippings. Dip the Lebkuchen into the glazes, letting the excess drip off and placing them on the wire rack to set. 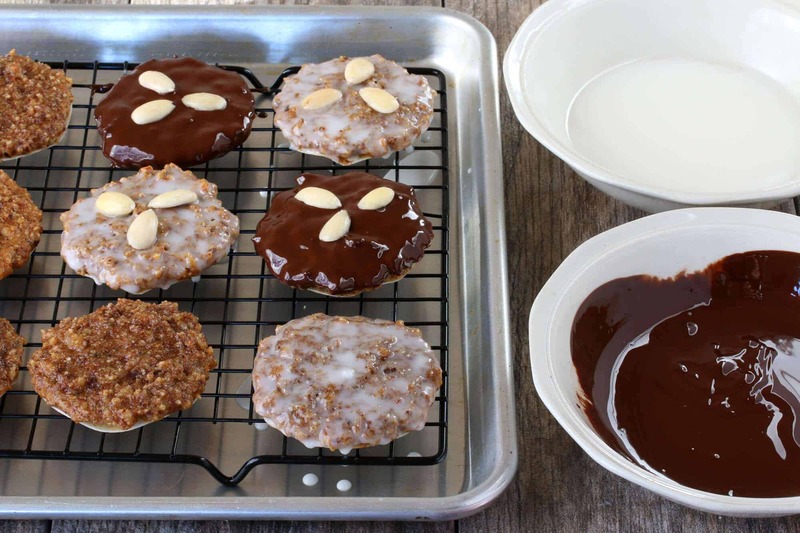 Place three blanched almond halves on each Lebkuchen while the glaze is still wet. Let the Lebkuchen sit undisturbed until the glaze is fully set. Keep the Lebkuchen stored in an airtight container. Discover why Elisenlebkuchen are Germany's most popular Christmas baked good! 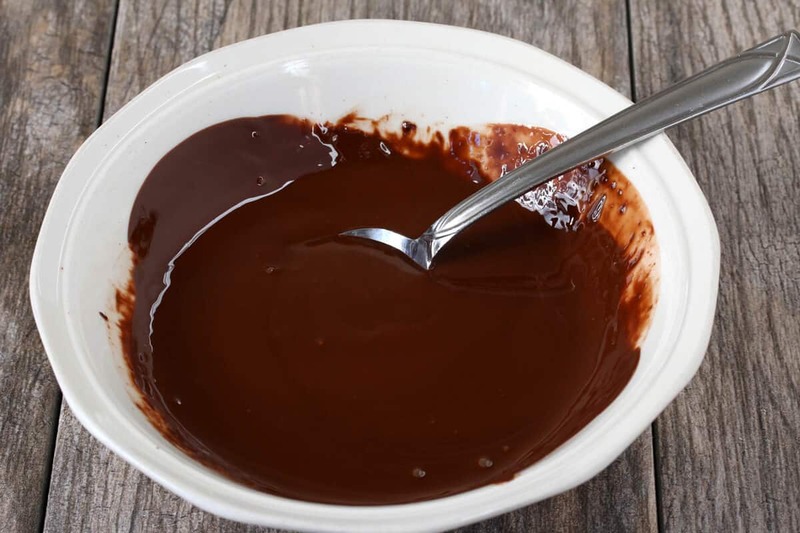 Directions: Place chocolate and oil in a small bowl and microwave stirring occasionally, until melted. Use immediately. If glaze becomes firm, reheat in the microwave. Directions: Place sugar and water in a small bowl and stir until smooth. 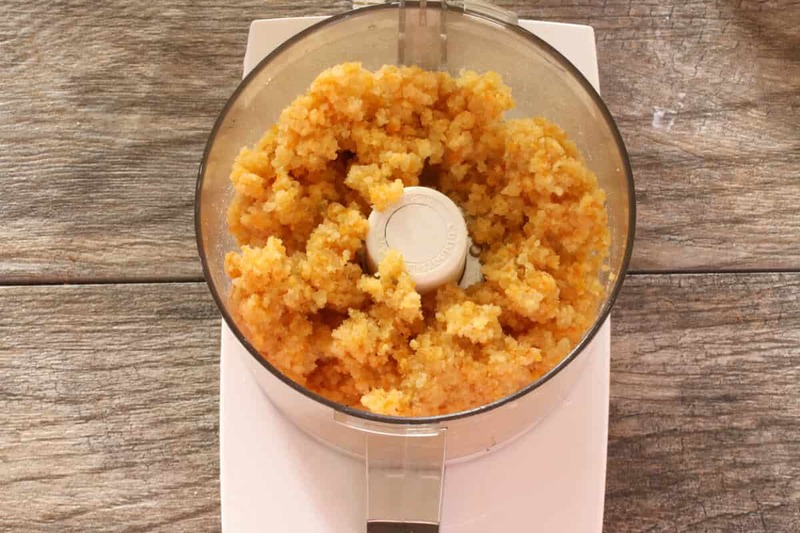 Toss the candied lemon and orange peel with about 1/4 of all-purpose flour to keep it from sticking together and then pulse in a food processor until finely minced. Set aside. In a large mixing bowl, beat the eggs until foamy. Add the sugar, honey and vanilla extract and beat until combined. 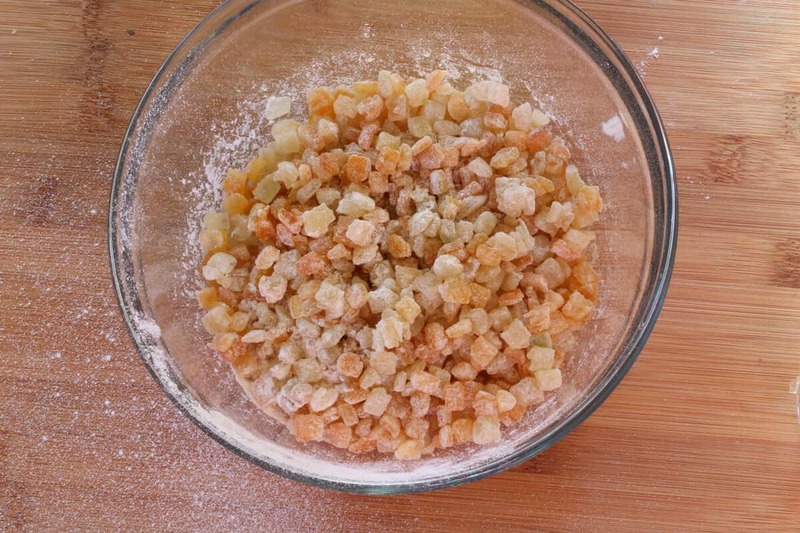 Add the ground almonds and hazelnuts, salt, baking powder, Lebkuchengewürz, and candied lemon and orange peels and stir vigorously until thoroughly combined. 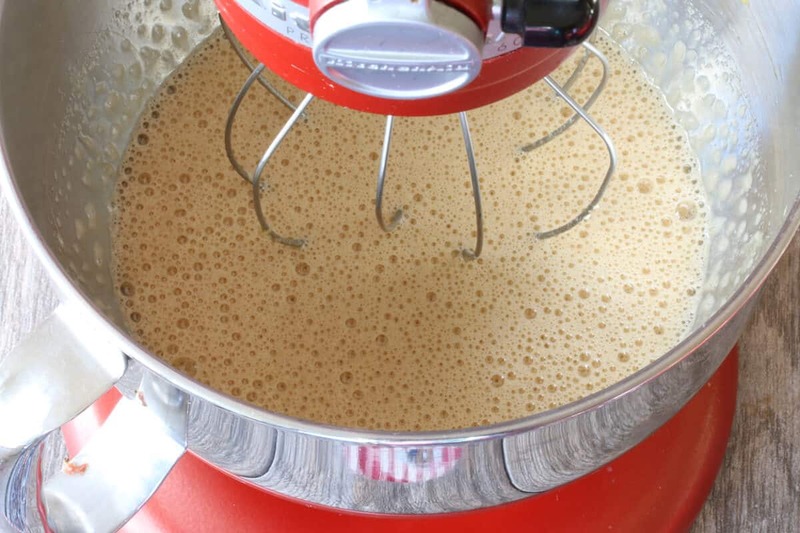 (You can use a stand mixer fitted with the paddle attachment and beat for about 2 minutes). The mixture will be wet but if it is too thin to scoop onto the oblaten add some more almond or hazelnut meal. Scoop the mixture onto the Backoblaten, smoothing down the top and leaving just a slight space around the edges. Set them on a lined cookie sheet. Bake on the middle rack of the oven for 25-28 minutes. Remove the cookie sheet and allow to cool completely. Once cooled, place a wire rack over a cookie sheet (to catch the drippings). Dip half the Lebkuchen in the chocolate glaze and half in the sugar glaze, letting the excess drip back into the bowl and then place the Lebkuchen on the wire rack. 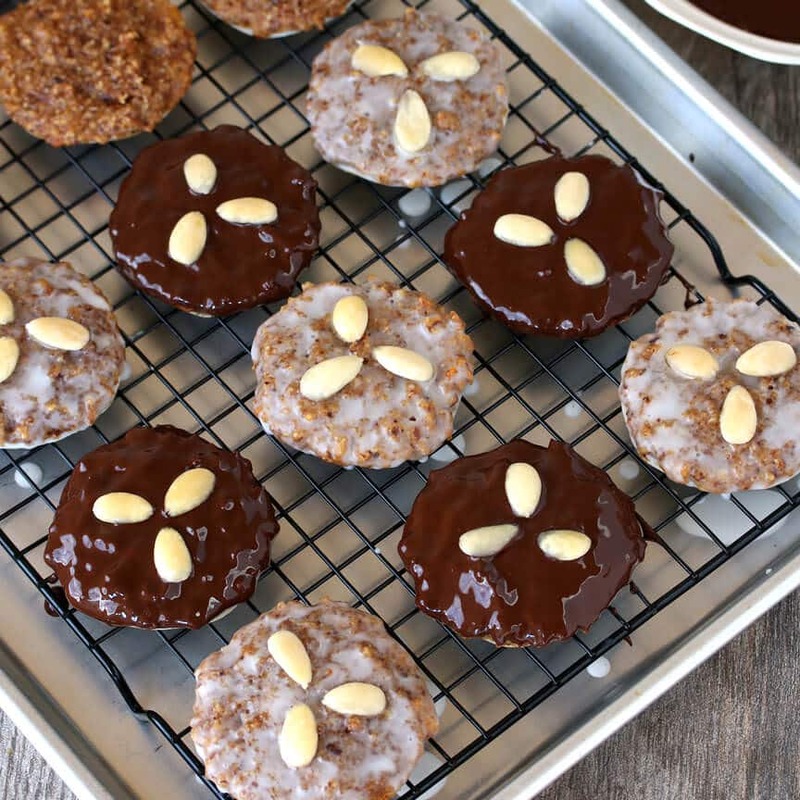 Arrange 3 almonds on each Lebkuchen while the glaze is still wet. Let the Lebkuchen dry completely until the glaze is hardened. Keep stored in an airtight container. Will keep for several weeks and the flavor improves with time. Makes about 35 if using 70mm Backoblaten and about 25 if using 90mm Backoblaten. For the very best results, make your own candied lemon and orange peel. It's very easy and once you've tried it you'll never get the store-bought stuff again! Here is my recipe for homemade candied lemon and orange peel. Hallo! I just starting subscibing to your blog after coming across some of the other German Plaetzchen recipes. So far I’ve made the homemade marzipan, the Heidesand (amazing!) and the Bettmaennchen (delicious! )- all fantastic recipes and great instructions. 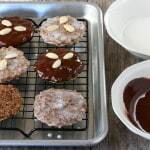 I will be making these Lebkuchen at the weekend since I was given a packet of Lebkuchen GeWuerz by a friend (we are Germans living in Norway, so this stuff is not available here and once I run out I will start using your recipe from homemade Lebkuchen Gewuerz). Your blog is wonderful, thank you! Hi Katie, I’m so thrilled to hear that, thank you! And greetings to Norway! My great grandparents were from Norway and though I’ve still not visited it’s at the top of our list. That’s terrific, Liam, I am so thrilled to hear that! Thank you and Merry Christmas! I have actually never tried this kind of cookie before, but it looks like something I’d absolutely adore! Oh wow, these look so good! I definitely want to try these! Had not heard of Lebkuchengewürz, the spice mix, nor the story behind these cookies. Thanks for the knowledge! We went to Germany last summer and enjoyed so many wonderful sweet treats so I am very excited to try this recipe! These cookies look amazing and scrumptious!!! A must-try! Your elisenlebkuchen look delightful! I would love to make these with the kids this year. I have to gather up all the missing ingredients and get rolling with the holiday cookies! Just lovely! I never heard of these cookies but they look wonderful! You make them look so easy to make! These look amazing! I love the history you included on them too! My daughter’s bestie is German so he makes treats like these and brings them to school. I could eat these all the live long day. Nothing better than recipes that are not only scrumptious but they’re pretty too. I’ve never had these before but they look wonderful and I’d love to try them! Thank you for sharing the history behind them as well. Food history is so fascinating to me! I’ve never heard of these before but they sound so good. I love learning about regional foods like this! There is a large German community at our school and I’m sure they would love these! Such a fun tradition! They are so pretty and I’m so glad that you added in the link for the Homemade Lebkuchengewürz! I don’t think we have any German places around here or anywhere that would sell Lebkuchengewürz! This so reminds me of our family memories, Mom used to store them in large crock and we would sneak over to it grab and run like blazes. Our recipe however called for flour and had been revised by family since past ancestors never wrote out recipes. In place of Blackoblaten, what do recommend to use? Hi Kathy, those sound like some fun memories. Getting your hand caught in the Lebkuchen jar is a past-time not everyone can brag about :) Pretty much all other German Lebkuchen varieties do call for flour, Elisenlebkuchen are unique in that they don’t, instead they have a very high nut content which makes them all the more scrumptious and also makes the texture unique. The Lebkuchen varieties that use flour don’t require the Backoblaten because they hold their shape fine without them. For Elisenlebkuchen they’re a must and unfortunately there just isn’t an adequate substitute. I’ve read in some online forums that Trader Joe’s carries them during the holidays but I haven’t verified if that’s still the case. I just purchase them online or at a German grocer about 30 minutes from where I live. Loving the story behind these tasty treats! My husband would flip if I made us these! Totally delish! I certainly don’t know how to pronounce it – but it sure looks amazing! Need to try this recipe! Wow! These sound amazing! :) And what a great traditional German recipe to be sharing for the holidays. Thanks for sharing the history behind these treats! I’ll have to make these one day for my fiance’s German family! All that candied orange and lemon peel has to make these some seriously awesome cookies. These look delicious! I think I had something similar at Oktoberfest, I can’t wait to try making them at home. What an interesting back story to theis dish! Who knew it could be so difficult to acquire some of the ingredients required? Would love to try this one for sure! Spent 3 weeeks in Germany backacking around the country but it was during the summer so never saw these cookies around! I love the little history lesson behind these! Honey adds such a delicious note to baked goods. I’m going back to Germany in the Spring and you’ve gotten me excited! My mom used to make homemade cadied citrus and ginger just as a snack. I bet it’s wonderful in cookies! I have very fond memories of Christmas in Germany including these cookies! You’ve done a great job explaining the history and method! Thank you so much for this recipe! Can’t wait to try it. My husband and I lived in Germany twice while he was stationed over there and lived off base. We had the wonderful gift of being able to speak the language and I learned to cook many dishes from my non English speaking German landlady and sweet neighbors. I love to acquire German recipes so that we can still enjoy the food. Your recipes are amazing! Since I found you online, you have been a great resource. I tried your spaetzle recipe with homemade sauerbraten and they were wonderful. Made us very homesick for Germany! THANK YOU for doing this so that others can enjoy the fabulous food that Germany has to offer. So, (now that it is November 1st,) how early can these be made before December 25th and be at peak flavor/texture if stored in a tin? Even a rough estimate would be appreciated. Isn’t this one of those things that has a traditional date to start making? Also, would candied citron (aka etrog or buddha’s hand) be atypical in the lemon & orange peel mixture? Thanks! Hi Hanner, no it’s not atypical at all, you can use either. Hi Hanner, in Germany many people make them several weeks in advance, even 6-8 weeks. The crucial key is how they are stored. For longer storage they should be stored in airtight containers without any moisture and in a cool place (60-64 degrees). I’ve learned how to make Marzipan and I also made the marzipan cherry streussel cake, only with strawberries. Now I’m very excited to try the 3 different german cookies you’ve got. Question for you. How far in advance can I safely make the 3 diffrent kinds of lebkuchen cookies you’ve got on your website? sorry I’ve just read the comments above. my question has already been answered. These were easier to make than I thought they’d be. They came out AMAZING! They didn’t last long! Thanks for the tip about the flavor improving over time. They were delicious fresh from the over, and even better the next day. Terrific, Melissa, I’m so happy you enjoyed these – thank you! I made a batch of these over the weekend. Hands down the BEST lebkuchen recipe I’ve ever tried. These take me back to Germany. Thank you! That’s terrific, Sandi, I’m so happy to hear that – thank you! Hi Jet, no, there’s no flour and yes, the batter is pretty runny and that’s normal. You scoop some up with a spoon and place it on the wafers to bake. If it’s runny to the point where it runs right off the wafer papers then add a few more ground nuts to the batter. And they came out just fine. Die oblaten help keep the soft body of the cookie together but not really necessary if you don’t have any on hand. Thank you for bringing back wonderful memories of Christmas markets and Otto Schmidt’s lebkuchen I can make at home. Those tins and boxes were getting expensive. Do you have a recipe for domino steine ? I got some at Trader Joes- delicious but I would like to try to make them! Nothing beats homemade, Suzanne – the texture is better and the flavors are so much more vibrant! Happy baking! Hi… my extended family is in Bavaria and I’m still dreaming about the lebkuchen we had in Nuremburg last year. I was so happy to find your recipe and the video/photos are very helpful. My question is how thick the dough should be on the cookie. Mine are quite flat but I made them to look like your picture. And because ovens vary, what should they look like when they are ready to come out of the oven. Mine looked very wet, so I left them in quite a bit longer than your recipe called for. Are they supposed to be a bit undercooked? Hi Linda, you can add more batter if you like but yes, they’re supposed to be pretty flat. And yes, they do look wet when they come out even though they’re not actually wet. Inside they’ll be fully cooked but somewhat moist and chewy. Hi Linda, egg cooks very fast so these Lebkuchen will definitely be done after 25+ minutes and you definitely don’t want them to be browned or crispy on the edges. I’ve tried a few brands of candied orange and lemon, including whatever the grocery store has in stock. Most recently I picked some up at an international import grocery store – I think they’re from Italy – but they don’t taste any better than the grocery store stuff. Guaranteed, nothing beats homemade. But store-bought is perfectly adequate. I have had the original many times and have tried to duplicate them for my family. These are even better! I’m so glad to hear that, Erika, thank you! Hi Danette, nothing beats homemade Lebkuchen and thank for the tip about homemade backoblaten! I made two batches of these yesterday. The yield I got was 92 cookies using the same 70mm wafers! I could not believe how amazing these taste! As good if not better than the ones my great uncle sends over from Germany! I can’t wait to hand these out to family. I used Bobs red mill almond flour instead of almond meal because it was what I could find in the store. It was so fun to make the spice blend myself too. Thanks for this amazing recipe! I will absolutely be making these again! That’s fantastic, Johanna, I am so thrilled to hear that! Thank you so much for the feedback! I use Bob’s Red Mill almond flour all the time (same thing as almond meal) and he also makes a “super finely ground” version that’s perfect for homemade marzipan. Thanks again! This was delicious! I searched online for a full day to find the perfect recipe. I ended up using 3 cups almond flour with 1 cup freshly ground hazelnuts, as I couldn’t find ground hazelnuts and tired out from grinding them. It turned out fine with just a few chunks of hazelnut in each cookie :) I visited 5 Christmas markets in Munich last year and enjoyed this treat at each of them! Now I can incorporate this recipe with my holiday baking every year – thanks!! I’m so happy to hear that, Megan, thank you! 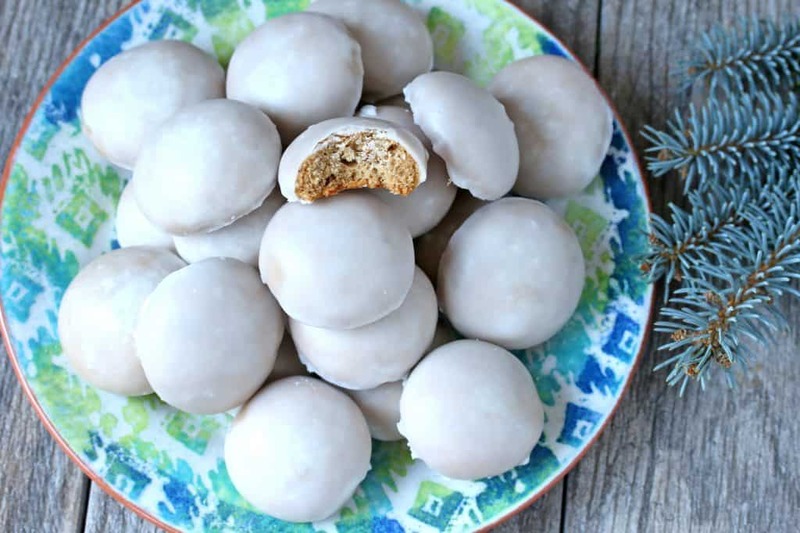 THE BEST LEBKUCHEN RECIPE! I made a test run of these lebkuchen before I gear up for the holidays. I’ll be making hundreds of these to give out to family, friends and work colleagues. These are THE BEST lebkuchen I have ever tried outside of Germany. They taste exactly, if not better, than I remember them from the years I spent in Germany. THANK YOU for this fantastic recipe. I’ve made these a half-dozen times since finding your recipe online a couple of years ago. Absolutely THE best cookie I’ve tasted in my 65 years on this planet, and so much fun to make. Thank you for recreating this vivid remembrance of my childhood! (And they’re absolutely perfect for dunking in my tea/coffee/hot chocolate on those cold January mornings. I am absolutely thrilled to hear that, ahansen, thank you so much! These are so delicious! Made exactly as written… made the gingerbread spice from grinding whole spices and made the candied fruits from scratch. These are amazing. Can’t wait to share. Thank you so much! Wonderful, Jen, I’m so glad you enjoyed them, thank YOU! I had written to you earlier as I couldn’t find oblaten in Canada so am now writing with an update. I finally had to ask a friend in Germany to buy some and send them to me by mail. Of course this took a while! Last week I tried your recipe rather fearfully as I’m not much of a baker. However, my motivation for eating lebkuchen was strong! Basically they came out fine and are very tasty and even look ok. I had two problems: had difficulty in placing and spreading the dough on the oblaten evenly. Any tips for this? Second, the chocolate glaze did not come out so well, was grainy and uneven I think because the chocolate didn’t melt into a smooth paste. I suspect I need a better grade or quality of chocolate. Can you suggest some or any advice on this? Meanwhile members of my family don’t really like them much which is great for me as I get to eat them all! Hi Frances, what an ordeal to get those oblaten but I’m glad you were finally able to! 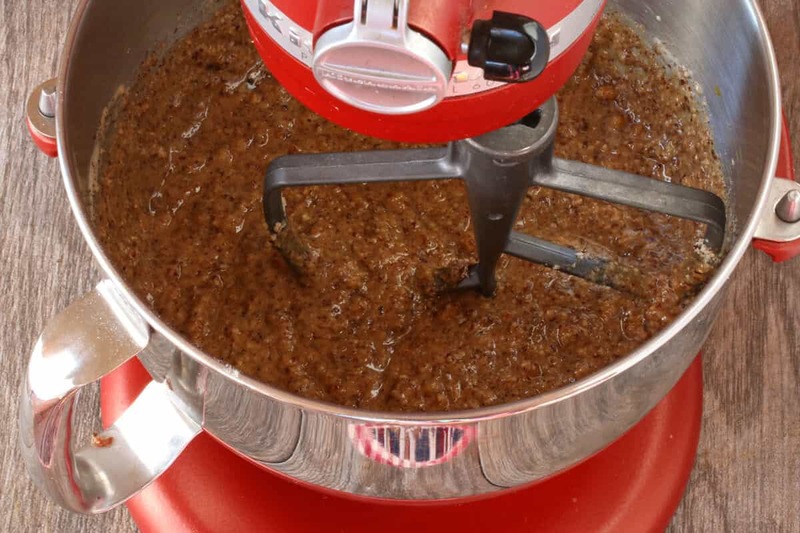 In spreading the mixture onto the oblaten: The batter is going to be a little lumpy no matter what, that’s just the texture of it, but you can use the back of a spoon to help smooth it – moisten the back of the spoon to help prevent the batter from sticking. The chocolate is grainy: That’s what is known as chocolate “seizing”. 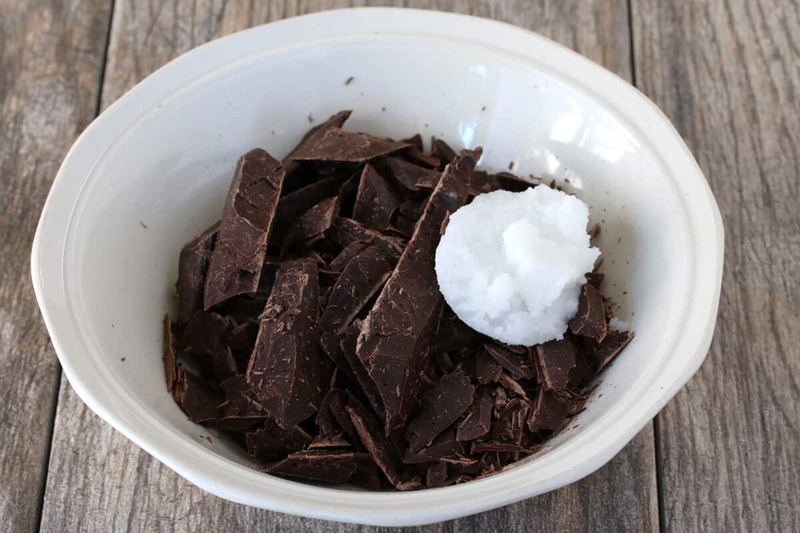 If even the tiniest amount of water or steam comes in contact with the chocolate as it’s melting it will cause the chocolate to seize and become grainy. The only way to prevent that is to make sure the bowl and utensils have no moisture on them and to keep the chocolate away from any water. Thanks for these tips … will use them next time… after I’ve eaten all of the first batch! Hi Kimberly. I discovered your recipe last year. My husband and I followed it making our own candied peels and lebkutchenwurtz as well. This year, we plan to make many more and will be making our own almond and hazelnut meal. Do you have experience doing so and if so, do you have any suggestions? I don’t want to compromise the recipe. I am also wondering how long the cookies can be stored for and if you suggest certain affordable foodsafe tins for storage and gifts. At what point are the cookies at their optimum? Thank you for sharing this delicious recipe it truly boasts the best tasting cookies I along with My family have ever tasted. Also, for those looking for back oblateb in Canada, we can usually find them in most European delicatessen’s and bakeries. There are two in Byward Market in Ottawa for example. I agree, these were the best Lebkuchen I’ve ever tasted, the flavors are so rich and the chewy texture is wonderful! THANK YOU, Kimberly! Well,we followed everything to the letter. Ihad a runny mess. I used almonf and hazelnut meal, as called for in your directions. I added almost another cup of meal and chilled dough before proceeding. So question: meal or nut flour? Hi Eva, nut meal and nut flour are one and the same, the names are used interchangeably by manufacturers. The batter is supposed to be fairly runny. As long as it stays on the Backoblaten you’re good to go. But if it’s running off the Backoblaten then yes, it will need some additional meal. Absolutely incredible!!! I can’t even adequately describe these other than to say they’re probably the most delicious baked goods I’ve ever eaten!! Turned out perfectly, thank you! Kimberly, I made these last night and am delighted with the result. Last year a friend brought us some Lebkuchen from Nürnberg and we loved it. I decided to try your recipe as it appeared the most authentic. I found the oblaten at The Cheese Boutique here in Toronto. My good result came even with using store bought citrus peel (oh, the shame! 😉). Next time… my one question is about storing the cookies. I left some un dipped and they are very sticky. Perhaps they don’t store well unless dipped? Or do they need to cool and then dry out a bit before storing? Wonderful, Heather, I’m so glad you enjoyed them, thank you! Yes, they will become a little less sticky once they’ve cooled but if some stickiness remains it would be best to store them in a single layer if possible, otherwise stacking them will likely cause the oblaten to rip when you pull them apart. Hi. I am wondering if I could substitute cashews for the almonds? Allergies. Thank you. Hi Aimee, cashew flour will substitute nicely. Happy baking! This recipe is great. I did all of the home,ade elements too! Baking at 300 left the cookies very soft and they didnt brown at all. Any ideas about that? Hi, they won’t brown because there’s no flour in them and their color is already brown to begin with – their color will pretty much stay the same. Yes, they will be soft when they first come out of the oven. Are they still really soft after they’ve cooled completely? You had me at Stuttgart!That is where my Mum was from. (I was made there! )While I have many of her German recipes, I need to find someone to translate, as Mum recently passed. These sound very much like the ones she baked every year, so I look forward to trying this recipe. Thank you. Wonderful, Jackie! I hope you enjoy these and the trip down memory lane! I can only find 50mm oblaten. Other than being smaller, how would I adjust the baking time? Hi Eric, baking time will be roughly the same, just check on them a couple minutes earlier to see if they’re done yet. Tried these today and the house smells amazing. I did run into a little trouble. For the last few years, hazel/filbert nuts have been largely unavailable where I live other than in those tiny 100 gram bags. Hazel nut flour may as well be moon dust! Not to be had at any cost. I was lucky enough to find large bags of hazel nuts this summer and threw a few into the freezer so I did have some to grind myself. I tossed the ground nuts into a warm oven for an hour which left the oil but got rid of the extra moisture. I did the same with my homemade candied peel. The end result was that my batter was too thick. (compared to what yours looked like in the video) I added an extra egg and that took care of the problem so thank you for the video!! I would never have been able to tell the correct consistency from just the pics! I’m on my third batch today so of course my husband and I have sampled a couple. They’re absolutely scrumptious and I’m sure will be as big a hit with my family this year as the Pfeffernusse was last year. My family lives too far away for me to visit them all other than Christmas. By sharing these wonderful flavors of their childhood, you’ve allowed me to bring them a little extra joy. Thank you again and here’s wishing you and yours a Very Merry and Joyous Christmas. Wow, Angelika, what a terrific example of how persistence and determination pays off! You sure went the extra mile to make these work and I’m so glad all went well and that you’re happy with the results. A very Merry Christmas to you and yours also! Thank you for posting this. My mother grew up near Stuttgart, and always made Lebkuchen for the Christmas season. I’ve never attempted it, as it seemed kind of daunting, and I never planned enough in advance to let them “age.” I’ll have to search for her recipe, but it must have flour in it, as she never used those Oblaten. I think she must have baked them on rimmed cookie sheets as they were cut in squares, and always had a glazed icing. I never had chocolate ones. They were always one of my favorites. I’m in California, so it’s easy to come by oranges and lemons, and should give it a try on candying my own, and then try making the cookies. Being retired, I have a little more time to experiment these days. I will be making sauerbraten with rot kraut and kartoffel klase (or maybe spaetzle) for Christmas dinner. Merry Christmas and Happy New Year to you and your family! Hi Georgette, there are many variations of Lebkuchen throughout Germany and yes, some of them are more cake-like and cut into squares. These Lebkuchen are specific to Nürnberg, called Elisenlebkuchen, and are always made without flour and baked on Oblaten, two of their characteristic traits. I hope you get the chance to make these, they’re wonderful! Your Christmas dinner sounds fabulous! It’s always been a family tradition of ours to have a German meal on Christmas Eve and New Years Day. Merry Christmas and Happy New Year to you and your family also! Hi Georgette, the square lebkuchen with a glazed icing might be Basler Laeckerli. I lived near Germany and Switzerland, in Alsace (France) for decades, laeckerlis are very popular there. I followed your recipe exactly and these were absolutely incredible, everyone LOVED them!! Mt husband and I were in Nuremberg in July where I got the opportunity to try this delicious cookie. This after it was highly recommended by our tour guide. I loved it! We live in Trinidad and so the only way I thought I would ever have these again was to make it myself. I searched the internet until I came upon your recipe. I did not know if this would replicate the cookies from Nuremberg, but based on all I saw in your recipe, it seemed as though, regardless, if it didn’t replicate it, it sure as hell would taste good. Anyway, long story short, after 6 months of sourcing the ingredients and doing everything from scratch,my brother and I made it just after Christmas and it was amazing. It was just like the ones I bought back in Germany. I savour every one. This recipe is a lifetime keeper.Thank you! Thank you! Thank you! I’m absolutely thrilled to hear that, Nadine, thanks so much for the feedback! Made a full batch today. I baked about 35 minutes as the color seemed too light at 28 minutes. I used the hollow type aluminum cookie sheet. Looking at the bottom of the cookie the oblaten is very flat around the circumference inward about 1/4 inch then is kind of puffey towards the center. The entire top surface is uniformly irm. If you push your finger in the center bottom it is spongy feeling. Breaking the cookie in half you can see it is a bit gooey in the bottom middle. Should the cookie texture be uniform throughout? Hello, Ive become addicted to lebkuchen. I don’t think I can wait until next December. So I think I will try making them! Some of the ones I had seemed to taste like marzipan to me, but I don’t see marzipan in the ingredients? Guess it’s the almond meal plus sugars ! Hi Lindsay, it’s NEVER the wrong time of year to enjoy Lebkuchen! :) Correct, marzipan is never added to Lebkuchen and it likely is the almonds and sugar. Happy baking! These look absolutely heavenly! I am of German descent so these would be fun to make! Oh I am wanting to reach into the computer screen and grab one. They look so so good. I love these so much! European cookies are the most fun to make for Christmas – they are so unique and scrumptious. Another fantastic recipe from you! You always break things down to make them so easy! These cookies are EVERYTHING!! Perfect for Christmas! Fantastic, Janice! 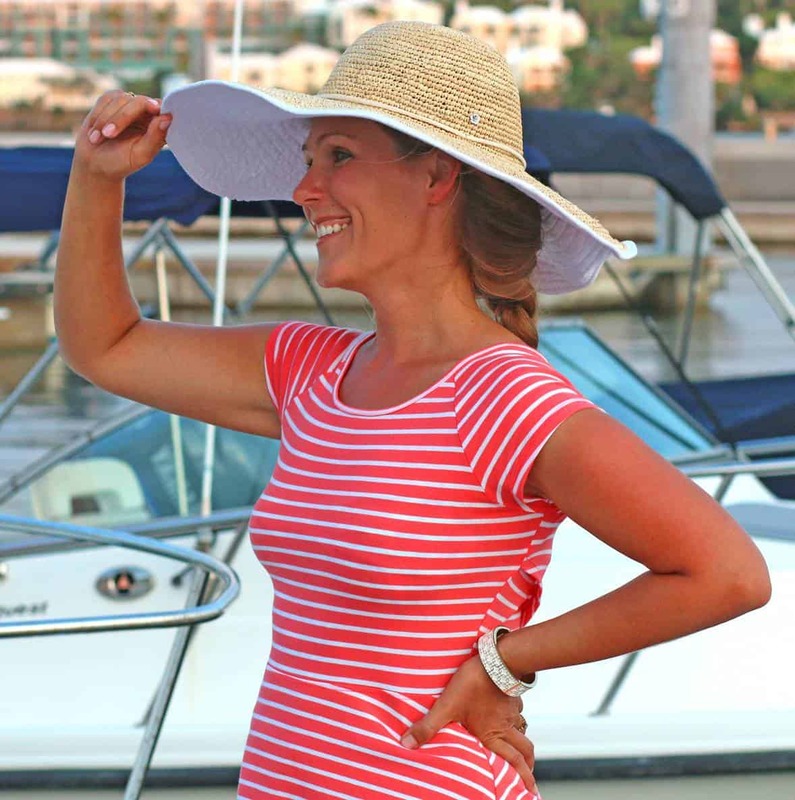 I really appreciate the feedback and am thrilled they were a hit. I’m so glad you took the time to make the homemade citrus peel and Lebkuchen spice, those make such a huge difference. Thanks again! This recipe is naturally gluten-free – almost! Could arrowroot, coconut flour, or even more hazelnut/almond meal be substituted for the regular all-purpose flour when processing the citrus peel? Thank you for your website! I love the German influence! And please do a recipe for Dominosteine as another commented – they sound unique and amazing! Hi Carrie, yes, you can use one of those substitutes. Thank you and I hope you enjoy the Lebkuchen! Hello! I know this is a bit old, but I’m hoping you still check comments! When making my own candied lemon and orange peel, how much of it should I use? I says 4oz, but I do not have a scale (I know, I should fix that). What would that translate in to in another measurement such as cups or tablespoons? Hi Susan, I’ve never measured it so I’m not sure and don’t want to throw out a guess. Perhaps one of our readers has measured it out and can chime in. I skipped the Backoplaten but used a plain circular cookie cutter to place the dough on the cookie sheet. They held their shape pretty well. Fantastic, Bob, I’m so glad you enjoyed them, thank you! Thanks also for the feedback on the citrus peel quantities as well as omitting the Backoblaten – we’ve had several people ask about that and will be glad to know they hold their shape. Thanks again! I just made my first batch of Lebkuchen today. My husband is in cookie heaven! He was stationed ti Stuttgart while in the military. He has always raved about the German Lubkuchen and said how much better it is than regular gingerbread. He has wanted to go back to Germany as long as we have been together ! (39 years!) Last year for Christmas we took the train around Germany and spent two weeks going to the Kristkindlemarkt in every city we visited! We bought Lebkuchen in Nuremberg and it was as amazing as my husband claimed! He says it tastes just like what we had in Germany. I used your recipe[e for the candied citrus also. Shelled hazelnuts and made my own flour as I was unable to find it around here. I actually do have a question! My batter was quite thin and the cookies don’t look quite as puffed up as the one in Germany or the ones in your photos. I actually added a little more almond flour but, still not quite the right consistency. I live at high altitude and am wondering if I might need to make high altitude adjustments to the recipe? They taste fabulous and the recipe was so fun and easy to make! Thank you for posting! Wishing you and your family a very Merry Christmas and Happy New Year!! That’s fantastic, Robin, I’m so happy to hear that, thank you! 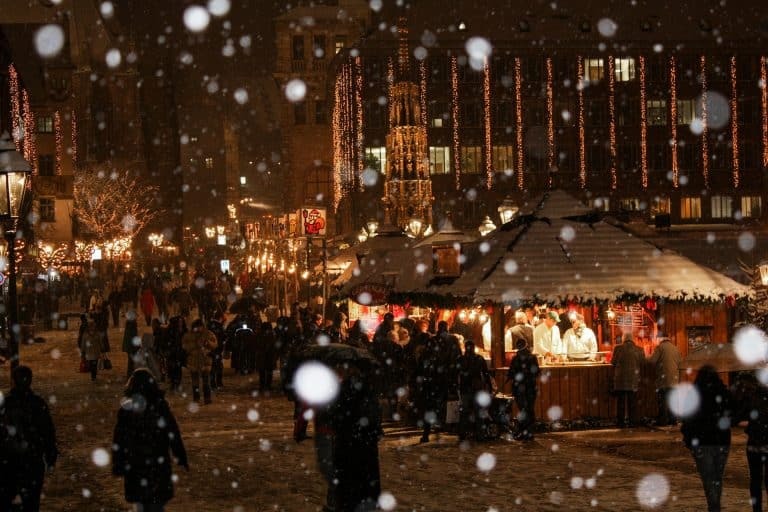 What an idyllic and magical way to tour Germany, hitting one Christmas market after the other. I’m so glad you guys had that opportunity. The thin batter – it definitely sounds like it was missing of the bulk base ingredients. 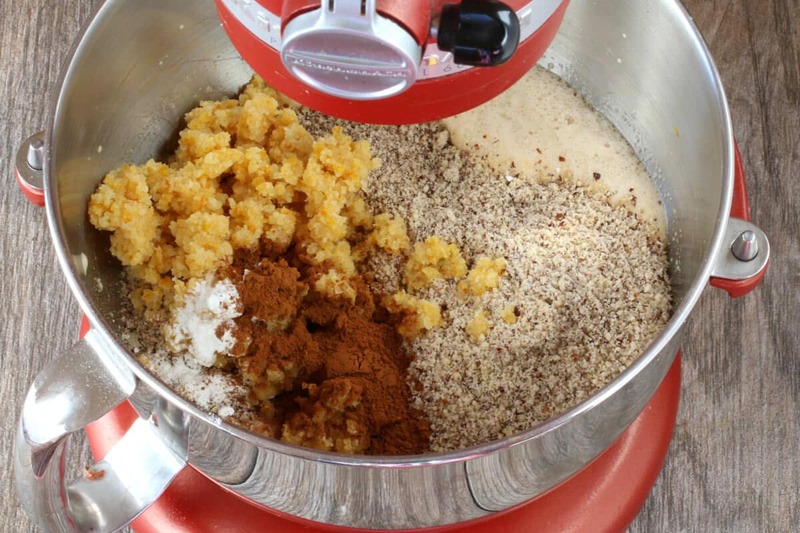 It can be trickier to get the right quantity of nut flour when you make your own. Because it’s freshly ground it still has a lot of oils in it, it’s “fluffier” (i.e. not as settled and compact), so when you measure a cup of freshly ground nut flour, weight-wise it may actually be less than a cup of store-bought nut meal (which would be denser and more compact). So there’s a good chance that it did need some additional nut flour added to it. Thanks again for your comment and a Merry Christmas to you and your family! Thank you so much Kimberly! They taste just like Germany! I found some Hazelnut flour! I made another batch and they came out magnificent! Thank you again for posting and getting back to me so quickly! Happy New Year!! Woohoo!! I’m so glad, Robin, thank you and Merry Christmas! Beautiful recipe! Can I bake these in batches to make sure they are all baked on the same rack for the same amount of time? Unfortunately I can’t fit two of my baking sheets on the same rack and I’d like to avoid uneven baking for the whole batch. Would allowing the mix to sit while the first batch cooks change the texture/quality of the final bake? Should I chill it? Hi Josh, that’s no problem at all and there’s no need to chill them. I would probably just wait to put the batter on the next batch of Oblaten just before you’re ready to bake them. That sounds delicious, and the pictures are just mouth-watering. Is it possible to use other dried fruits (I’m not a big fan of citrus peel). I’m thinking of dried apricot, dried pineapple, maybe candied ginger… What do you think? P.S. Thanks for the wonderful recipe! Thank you so much, Kimberly, for posting this recipe! I lived three years in Germany in the 70’s, and loved the Lebkuchen. 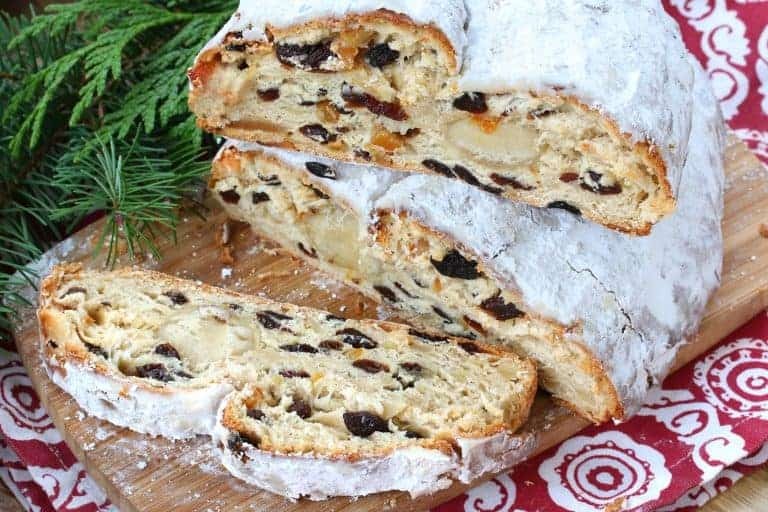 In recent years I’ve tried to find a recipe for the authentic version, but have been unsuccessful until today when I stumbled onto yours when looking up stollen. I’m very excited and looking forward to making this wonderful cookie, that I first tasted at the Christkindlesmarkt in Nuremberg! Wonderful, Teresa, I hope you enjoy it. Please let us know what you think once you’ve tried it. Happy baking and Merry Christmas! What a scrumptious recipe! It was the first time I’ve made candied fruit and I used dark brown sugar, which might be a mistake, but when I made my lebkuchen,they tasted amazing! Thank you for your excellent instructions and recipe. The best thing that’s ever come out of my kitchen!!!! I’m absolutely thrilled to hear that, Lis, thanks so much! I’ve been making something like this for 40 years — much beloved! But it’s always been the sheetcake kind, too thin to make round. Now I will try this one (very similar ingredients) and have ordered the oblaten from amazon. I look forward to it. In response to Lola, the peel is important, but you probably won’t recognize it in the cookies. I do use dried apricots for about half the amount, but don’t think I’d cut out the peel entirely. Homemade peel gets more compliments than the commercial which I’ve had people say they don’t like, and then turn around and happily down the homemade. Give it a try…. Thank you for the recipe! I have to admit these are the best cookies I’ve ever tasted! I was nervous making them as it was my first time and I did make mistakes but I can’t wait to make them again and get better at it. So delicious!!! Thank you for sharing. Fantastic, Albena Ivanova, I’m so glad you loved them, thank you! Have loved lebkuchen all my life. Never knew how easy they are to make them!! !